So here is how the story goes, I’m munching on sweet baby peppers for a snack and Gavin asks to save some peppers for him. He pops in and replies, What?! You’re eating those without dip?!? (Yes, Gav. Eating plain vegetables won’t kill you). 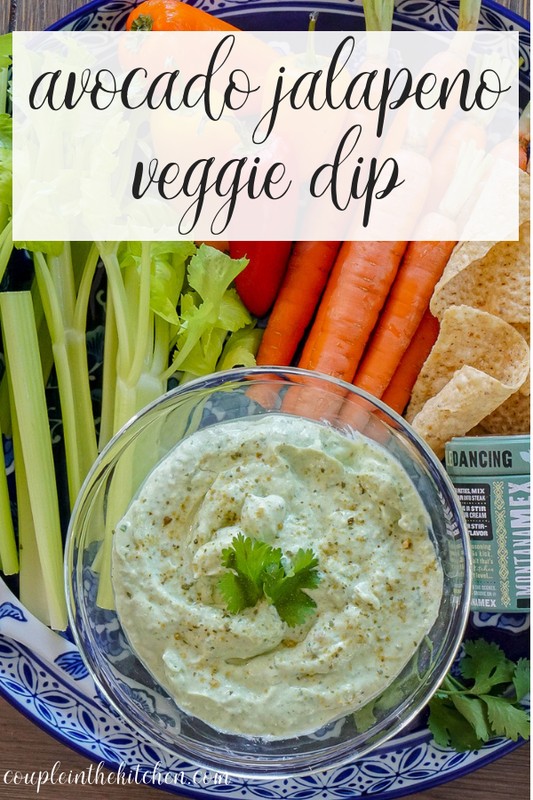 After about 3 minutes of Gavin convincing me why dip was an essential part of the snack, I grabbed some of the ingredients I had on hand to make a quick, healthy veggie dip. After blending everything together, we knew this recipe was so quick, so easy, and so delicious that it needed to be added to the blog. Which meant it was time for an impromptu photoshoot! Our little healthy snack break turned into us working in the studio (aka kitchen). It’s all good though! We are sure you all will appreciate it. This dip recipe is great because it is actually pretty healthy and full of protein as it uses Greek yogurt. It is compliant with keto and the 21 day fix eating plan. We paired it with baby bell peppers, carrots, and celery. We both grew up cutting the leaves off of celery but recently we’ve been all about celery leaves. They even came as a garnish on our fried artichokes at a restaurant review last week! Lastly, we added some tortilla chips to the platter. Guess what happened? Gavin ate all of the tortilla chips and left the veggies, ha. Whether you skip the veggies or not, you’ll love this avocado Greek yogurt dip recipe. 1 jalapeno, include the seeds if you like spice. You can buy Montana Mex seasonings at HEB or on their website. If you don't have it on hand, substitute with a clove of garlic, and additional salt and pepper. Add all ingredients to a food processor or blender. We actually just used a protein shake cup on our Ninja Blender, and it whipped it up fine. Blend until smooth and combined. If the dip is too thick for your liking, add a splash of milk or oil to bring it to a thinner consistency. Love this recipe? Please share or pin this post and tag us on social media.